Enjoy videos and DVDs on Sansa View easily! 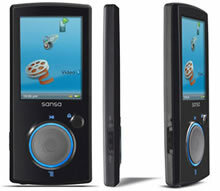 The SanDisk Sansa is a line of flash memory-based digital audio players and portable media players produced by SanDisk. One of the currently selling products is Sandisk Sansa View. Sansa View is selling in capacities of 8GB, 16GB and 32GB and comes in black only. Sansa View has an FM tuner, a voice recorder and a built-in microphone. Sansa View also has an expansion slot for adding more memory and it accepts MicroSD and MicroSDHC cards. Sansa View supports viewing JPEG photos. Sansa View can play MP3, WMA, DRM protected WMA, WAV, unprotected AAC and Audible audio books, Sansa View also supports music subscriptions from Yahoo! Music, Rhapsody To Go, Napster and eMusis. Sansa View also support video playback, the supportable video format is MPEG4 SP with MP3 or PCM audio in .AVI extension, and MPEG4 SP or H.264 with AAC audio in .mp4 extension, and WMV9 with WMA audio in .ASF or .WMV extension up to 30fps. Sansa View can also work on MAC OS. For more details of specifications of Sansa View, please visit Sandisk's official website. Now let's have a look at how to convert video files for Sansa View. Sansa View supports some video formats under some conditions. You may hesitate about choosing a video converter and wonder how to convert different video formats. With Any Video Converter Professional, it's all that simple. Any Video Converter Professional is an All-in-One video converting tool with easy-to-use graphical interface, fast converting speed and excellent video quality. It's exactly what you need. Any Video Converter works as a Sansa Media Converter, it converts any videos for Sansa View. First step, download Any Video Converter Professional from Any Video Converter website and install it. Trial version can convert 3 minutes of each file and there is no other limitation. Launch Any Video Converter Professional. Click Add Video button to add the video files you want to convert for Sansa View. Any Video Converter Pro also supports converting online videos like YouTube, Google Video, MetaCafe and Japanese Nico Video to other video formats directly. What you need to do is just to paste the URL of your favourite online video to the program. Meanwhile, Any Video Converter Professional also downloads the video to local hard disk for your further usage. Second step, find and unfold Sandisk Sansa group and select WMV or MP4 file for your Sansa View. The best video size is 320 x 240, however, it can be up to 640 x 480. WMV output needs to be encoded with WMV V9 video codec while MP4 can be encoded with mpeg4 or x264(H264). Third step, click Encode button to start converting. After encoding is finished, click Output Folder buttons in the left bottom and you can find the output files. You may also need to rip DVD for Sansa View. With Any DVD Converter Pro, you can easily rip DVD to MP4 or WMV formats compatible with your Sansa View. Any DVD Converter Pro works perfectly as it's Any Video Converter Pro plus a DVD ripper. Download Any DVD Converter Pro to have a try! Before ripping DVD, unfold DVD Options in the right settings panel, set Audio Language to the one you would like the movie's sound to play in. You can also set subtitile language and angle. If you don't like the DVD to be separated as titles, click Edit >> Options >> DVD and check. For some copy-protected DVDs, you can try DVDSmith Movie Backup which is a free program that can help you copy entire DVD to hard disk, or Any DVD Cloner, which helps you to make perfect copies of your DVD collection. After the video files or DVD are converted to Sansa View compatible video files, you need to transfer them to the player. You can use Windows Media Player to sync Sansa View. Connect Sansa View to your computer, Open Windows Media Player, click Sync tab, drag-and-drop the videos files to sync list, then click Start Sync button. Sansa View also allows you to select either Media Transfer Protocol (MTP) or Mass Storage Class (MSC) transfer mode. In MSC mode, you can use Windows Explorer to drag and drop most content, not including DRM protected contents, into the Video folder on the player, which shows up as a drive when connected and set to data transfer mode. MTP is the recommended setting which enables you to use software media players, playlists subscription services and transfer DRM protected contents. If you are using Sansa View with MAC OS, you can try MSC mode to copy the files to your Sansa View. After the files are successfully transferred to Sansa View, you can enjoy your video files as you like.